When it comes to service, is conformity contagious? There are probably a lot of reasons why a company can become known for exceptionally good or bad service. One possibility I’d like to consider is conformity. This post poses more questions than it answers, so I welcome your comments. Conformity is a strange mixture of social pressures. We may go along with the group out of respect for social norms or because that many people can't possibly be wrong. In service, conformity can exist among employees and among customers’ perceptions. Walk into any In-n-Out during a busy rush and you’ll see a whirlwind of employees serving customers, preparing orders, and cleaning up. If you look carefully, you’ll see employees taking subtle cues from each other. They interact with each other in a positive manner. Each person hustles to do their job quickly and correctly because another employee is depending on them to keep things moving. A lazy or rude employee at In-n-Out would stick out like a sore thumb. 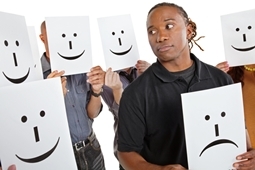 Poor customer service can also be contagious among employees. They loiter and talk while customers go unnoticed. They complain to each other about customers, co-workers, and corporate. Soon it becomes uncool to go out of your way to serve a customer. Nordstrom may be one of the all-time customer service legends, but I have yet to have a good experience shopping there. I’ve even gone back many times against my better judgment because I keep thinking it’s me. Maybe I’m unlucky, maybe I was having a bad day the last time, maybe I’m just not Nordstrom’s material. The strangest part is people tend to get a little weird when I tell them I’m personally not a fan of Nordstrom. “What do you mean, you don’t think Nordstrom has good service? !” I often start feeling the pull of social pressure and silently ask myself whether I need to give them one more try. This experience makes me wonder if customers conform in their opinions of businesses. For example, does the Cheesecake Factory offer amazing food at ridiculously low prices, or could there be another reason why people routinely wait more than an hour to eat there? (Or both? Mmmmm. Cheesecake Factory...) On the other hand, you may have an outstanding customer service experience at the DMV, but prepare to be mocked if you choose to share your story with friends. For now, it's all food for thought but I hope this subject may become a chapter in my book, The Unnatural Act of Customer Service. I welcome your comments, especially if you have links to information on the subject or personal stories to share.